Teenagers don’t run away in January. Not in upstate New York. In summer, they’ll go out drinking with friends, pass out in a field somewhere, wake up hungover and covered in mosquito bites. In the spring and fall, they’ll hop a train down to New York City after a fight with a parent or a problem at school. The Port Authority cops will pick them up, usually after a day or two when they discover there really is no place to sleep in the city that never sleeps — and worse, no place to shower. But a January disappearance was different. Jimmy Vega had only to look out at the early-morning ice sparkling on his windshield to understand that no teenager would choose to walk off into the blue-black heart of such a night as last night. Especially not a girl like Catherine Archer. We chat about her series, which I’ve listed in order below, and about the first-hand research she does to get the details right. I also was so pleased that she mentioned Howard Fast’s novel, The Immigrants because it means I can link to his beloved series, even if it’s not a mystery. Suzanne, thank you for joining me. 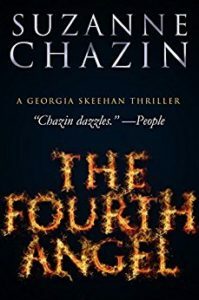 Suzanne Chazin: Thank you. It’s a pleasure to be here, Laura. LB: Okay, I have to follow up the Lee Child quote. How did Lee Child find you to praise you? And how excited are you about that? SC: I have to say, it’s a funny story because I have known Lee for many, many, many years. When I was writing my first novel, and I had just sold it to Putnam, that weekend Lee Child was doing a signing for his third book. And it was in a small bookstore, and back in those days, maybe 12 people would show up for a signing of a Lee Child book. I went over to his house, I met his wonderful wife, and we’ve had an on and off relationship through the years. I do think he is a fan, and I am a big fan of his work, but I can’t pretend that suddenly out of all the books in the world, he plucked mine. He was very kind enough to read it and was very, very supportive always of my career. I’ve been very, very lucky. LB: Looking at your bio, you’ve also always been a writer. SC: Yes, I have. I started out wanting to be a novelist, and of course realized very early that novel writing doesn’t pay. So I became a journalist for many years, and I worked for a number of publications. I worked more than a decade for Reader’s Digest as a writer. I think, although people like to make fun of Reader’s Digest, I actually think I learned a lot about how to write in Reader’s Digest because those short articles have to hold the reader’s attention. At the time I was writing, we had 16 million readers in the United States. So it was a great place to learn if you are doing the right thing. LB: That’s so interesting. I never thought about Reader’s Digest as having their own staff. SC: Fifty percent of the articles were generated by the staff, or freelancers per se. They were not picked up from other magazines. That often happened. I would tell people I’m a writer for Reader’s Digest and they would say, there are no articles in Reader’s Digest. And I’d say, well, actually there are. Fifty percent of them are originals. I’m actually very proud of a piece that I wrote years ago that broke a medical story and the guy went on to win the Nobel Prize in medicine. And I was one of the first people to break his story. So we did do some amazing stuff. You had to learn to be succinct and get to the point, and you had to make people interested. LB: It sounds like some of the news you covered might also have led you to want to write fiction. SC: When I was writing nonfiction, I always wrote narrative nonfiction. I like to make my nonfiction stories. So that when I came along to write fiction, it was an easy jump to make my narrative fiction to be a serious and correct manner. I always wanted to make things accurate. I was really important. When I wrote the Fire series, I made sure that when you walk into a firehouse in my story, it’s accurate. When things happen in the fire, it’s accurate. And certainly in the new series, about what Jimmy Vega experiences in the undocumented community, I’m pretty knowledgeable about the way those things work and it’s pretty accurate. LB: How did you make the jump from writing nonfiction to writing novels? SC: Like I said, I was wanted to write fiction, and I actually joked when I was writing nonfiction, people would say, “Oh, you’re writing fiction now.” And I’d say, “No, we just get to call it that.” Because I think my nonfiction, while always accurate, had a sweeping sense of the possibility in it. Let’s put it that way. I tried to look for the connections that might have been there and might not have been there quite so obviously. It always was, for me, the next step, to tell a story that was as true as nonfiction, but carried the emotional impact of fiction. The thing I missed in writing nonfiction is, people behave the way they behave. You can’t change that. And in fiction, I could actually create characters and have them act out the things I really wanted to tell. LB: Your first series was about a female fire investigator, and that was actually inspired by your husband. SC: Yes! My husband is actually retired now, but he was a deputy chief in the FDNY, he was 30 years in the New York City Fire Department. The funny thing was, I never thought about writing about the fire department. I was working on a first novel, it wasn’t going anywhere, and my editor, when I was still working in magazines, said to me, “You’re always writing about stuff that you really don’t know anything about. When you write about something you do?” And he mentioned that my husband was a firefighter. I said, but I don’t know anything about that. I’m not a firefighter. And besides, most of the firefighters are men and I’m a woman. And he went, “Exactly.” And I said, oh, yeah, writing about a female firefighter or fire investigator would be kind of interesting. Then it set me off into being a journalist again, really making sure that I was accurate, learning all the technology, the lingo, everything. And then trying to put that in full that into an exciting story. LB: The Fourth Angel was your first novel. LB: And that was actually inspired by an unsolved crime. SC: Yes. Yes, it was. There was a lot of interest back in the early 1980s because there were a series of fires that were never actually solved, and they burned at a very, very high temperature. This was actually in the era before terrorism per se, so people weren’t really thinking about — these were not terrorism fires — but they were not thinking about the way major destruction can be achieved by simple weaponry. What happened was, it was basically fertilizer bombs. They figured out what it largely was, they replicated it, but they never actually figured out who did them. And these were not structures that were habited, these were things that were probably insurance losses, that kind of thing. And I was intrigued. I was intrigued by these incredibly destructive fires. It sounded like the basis of a good story. LB: The other thing I think that might have intrigued you, because it certainly comes out brilliantly in your novels, is the people who rush into fires themselves. SC: Yes, yes. One of the things I always like is, you should look at your characters never as something like Hero with a capital H, or your Villain with a capital V. People are people, and I am always most interested in that. I like to look at ordinary people and what they do in moments of being extraordinary. I find that’s the most interesting. I really look at sort of the saga of firefighters, ordinary people who had a notion of rushing in when everyone else is rushing out. Doing the right things. I started the series before 9/11, my first book came out seven months before 9/11. And people said, why are you writing about firefighters? And I said, oh, you know, my husband in the background. And of course after 9/11, everyone was like, why hasn’t there been more written about firefighters? Because people didn’t even think about it before then. LB: Why did you stop at three novels for Georgia? SC: Several things happened. One is, while it might seem like a wonderful idea to be writing fiction about firefighters after 9/11, it really wasn’t. What happened was, even though I started the series because my own personal connection with firefighting, and I wrote the first and second book in the series before 9/11, there was a presumption, I think, that I was that I was trying to capitalize on 9/11. Which I was definitely not. So it was a little uncomfortable. There was a little bit of a sense that, why are you doing these books in that way. Plus I had a lot of personal things: my second child was born, my mother was dying, and it became really a lot to handle writing. So when I started the fourth book, I just couldn’t get through it. My publisher said, well, it’s a series, we can’t wait a year for you to do another one. So we stopped on the idea that I would start up again and I didn’t for 10 years because I didn’t have the time. And then when I came back, I found that I had grown as a person and that my interests — not to say that I wouldn’t write about Georgia again, I certainly would — but I just felt a lot of other things were happening in the world and there were other types of people I was interested in looking at and doing things about. LB: That’s a terrific segue into your Jimmy Vega series. SC: To give you a little bit of a sense of what happened, while I was still actually, believe it or not, writing the Georgia series, I lived in a town called Mount Kisco, New York. I would be in the city, in that downtown, all the time and I would see a lot of immigrants waiting at the train station for jobs and things. This was back in the early 2000s. I don’t speak Spanish, and I thought, gee, these people, sometimes in the winter, they look so cold, they look like they’re really hustling for work. I wonder what their story is? So even back when I was writing the Georgia series, I had an interest. And then, in that ten year period, when I wasn’t writing, I was doing work volunteering at a center for new immigrants in Mount Kisco. And I found myself drawn to their stories because, just like with the firefighters, I want to get behind what people assume about them. Oh, their heroes, they’re amazing, they’re tough guys — well, there’s a lot more to them than that. I also wanted to do the same with the whole notion of immigration. I wanted to get behind the people, and the way I saw my way through it was to do it through an American cop who has a Puerto Rican background, Jimmy Vega. And sort of have him straddling two worlds. In a way, like Georgia does. Georgia is a female in a male dominated profession, she’s 5 foot four, she’s straddling this divide between the civilian world and a lot of people who say she’s this short woman who can’t do the job. And she’s doing the job. Jimmy Vega’s straddling two worlds, too. He’s an American, he’s also a Latino. So that’s what I was looking at. LB: And he’s also a cop and a member of the community. LB: I really love how you have people blend different worlds. Jimmy was married to a woman who was Jewish, and that actually plays out in your most recent book a little bit, in terms of him be able to make connections with other people. SC: Yes, yes. I mean, I feel we are a country of immigrants. I myself am a first generation American. My father was born in Russia, came here as a little boy but was totally involved with the Russian community as a child. My mother came here halfway through her life, English but from Irish background, and she ended up going back to England for the last part of her life. She’s gone now. Both of my parents were kind of clueless about America in certain ways, and I was first generation. So I’m always drawn to the immigrant story. One of my favorite books growing up was Howard Fast’s book, The Immigrants. I find myself drawn to people, once again, people who are straddling two worlds. I found that Jimmy’s story really told that and I found that the people he was surrounded with told that same story: his wife, who is Jewish; in the most recent book, a Holocaust survivor, an elderly man. Just looking at all the different people who are dealing with both the culture here and the cultures they came from or that they know. LB: So in that book, which I thought was just terrific, one of my favorite characters is Catherine, the girl who goes missing at the very beginning. She also straddles more than one world. SC: Yes, that was really important to me, to go against what people think. I decided if I was going to make this beautiful young teenager, this girl from a prominent family, everything going for her, she’s a good student, she’s an outstanding tennis player — that I wanted to have her have depth. And have her be able to move between worlds, and also have the reader surprised by the ways that Catherine is interesting. In other words, it’s easy to take a character and say, well, she looks like a goody two shoes but she’s secretly all these terrible things. I thought it was more interesting to make her someone who had all this depth that wasn’t bad, it was good depth. But it was different than what people expect. 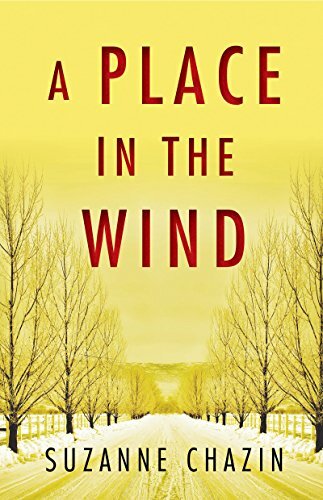 LB: A Place in the Wind is the latest book and it’s number four in the Jimmy Vega series. LB: How have you seen both the character of Jimmy and also the series, do you feel it’s matured over the four books? SC: I think so. I think I’ve matured. I think I was very, very eager on the first book to tell everything and every part of the story. I realized that, going along, that you can’t. It’s a very complex story, it’s the story of a whole group of immigrants in this country and how things are going about. Some are undocumented, some are legal, some are born here. We’re dealing with all sorts of things. In my first book, I really concentrated on Jimmy’s story and his relationship to his past, his ex-wife, his daughter, and of course the background story’s of an undocumented day laborer. And then in the second book, I started to look at — which is kind of timely today — about abuse of women. And how women in vulnerable positions can find themselves in a position where men can take advantage, powerful men can take advantage of them. 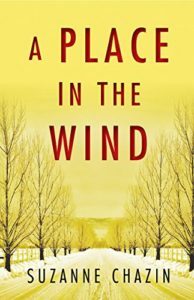 And then in the third book, I found myself, it was right after the shooting of Michael Brown, and I felt that I wanted to explore what that must feel like for a cop, when he shoots someone and the shooting is controversial. And I felt that Jimmy is a cop, and I felt that he’s a good cop, we know by the third book, we know he’s a good guy. He’s not a vicious guy. But he made a terrible mistake, and what that would feel like. So each book is a growth process. And the fourth book is what happens when a town makes certain assumptions about people and about relationships and they are wrong and the damage it does. LB: I thought it was really interesting how quickly things can spiral out of control. You really captured that feeling. SC: Yes, and I think that’s what happens. I think we’re all capable. You can see this, how people make judgments. Look at Facebook, Facebook is like that. It’s like everything tilts one way and then everything tilts another. Something happens and people go on for one thing. And I feel that we are all so easily manipulated by the images we see and the stuff we have around us. So you have a young, beautiful girl and she’s murdered. You have certain suspicions about who murdered her and you’re going to go in one direction. And it turns out you might be wrong, you’re going to go in another direction. I think I really wanted to look at those fissures in the community. Lake Holly, this fictional town of Lake Holly, is a vibrant, multiethnic community. People are trying the best they can to get along. They’re doing a pretty good job of it. And then along comes this young girl who’s teaching English at a center for immigrants and she disappears, and the suspicion falls on the people she was teaching. That is going to split apart people, it’s going to make people quickly change their minds. You can see this every day when certain things happen. LB: A Place in the Wind, there’s a moment in it that really reminds me of To Kill a Mockingbird. SC: Oh, okay! I haven’t read To Kill a Mockingbird in probably 30 years, so please, tell me where it is. LB: It’s that you have amidst this tremendous tension, there’s a situation that spiraling out of control and the adults are being mulish and not listening to reason, and then you and on a moment of hope. Because the children get involved. LB: There’s a moment where they, then, allow other people to become human again around them. SC: Right, right. Well, that’s what happens. I felt like, a lot of times what ends up being the spark for something bad for the water for something good, the thing that puts out the flame, it’s often the smallest thing. And so I really centered on the notion of a dog’s business on somebody’s lawn. Because it’s just the kind of stuff that starts things, you know? I felt I wanted something really petty, something that gets under people’s skin as neighbors and just sets off things. Then, if I’m going to start with something really petty like that, I wanted something really everyday that makes people go back and go, oh, yeah, we’re all here. We are all in the community. We all need to pull together. And I felt, that’s children. That’s what people feel. So that was really important to me at that moment, to have that same thing, have something ridiculously small spark it, and something everyday end it. LB: There’s one thing that I caught in your bio that I’m just dying to ask you about because I’ve never done this: you took a police academy course. LB: So when you say you do research, you’re not kidding. You just throw yourself in there. SC: I had fun! I had fun. Let me tell you, that was one of the most fun courses. I had to do all sorts of great stuff. I learned I can’t shoot for the life of me, by the way. I’d never picked up any kind of weapon and they have a firing range-thing, but not the real firing range. It’s like a laser tag thing, but it’s pretty serious. They have you do it and, oh god, I couldn’t hit the side of a barn! So I learned that. I learned that I never want to try to drive drunk because they have a machine that shows you, produces what it feels like to drive drunk, and I would have killed 17 people, I’m sure. But it was great fun and I learned a lot. And one of the things I really learned was to see things from the perspective of the police. I do a lot of work, obviously, with the immigrant community and there’s a lot of fear. And you can see it and understand it from their point of view, but one of the things people don’t realize with the police is how frightened they are. I mean, they’re not allowed to show it, they’re supposed to come on really strong. But the truth is, every time a police officer stops a car, he doesn’t know what’s inside that car. Every time he goes on a domestic disturbance, he doesn’t know what’s on the other side of that door. And they’re scared. They talk about some of that stuff. I learned that police officers, when they stop a car, they always touch a certain spot on the car with their hand, and they do that because if that car, someone gets out of the car and shoots and kills them, that fingerprint is the only way that they’ll ever be able to link who did it. So police officers are trained to take their hand and touch a certain part of the car when they approach. Because they have to think about, they might die. LB: That’s, that’s incredible. Well, what’s next for you? SC: Well, I’m working on the fifth book. Which is giving me some trouble right now so, it’s hard. Let me tell you, I am not a first draft writer. I am definitely a 17th draft writer. One of the hard things for a series — Lee Child would say this, too, I think — is that, when you’re starting, you’re very excited about every book. And then you’re still excited a lot about your characters, but it’s hard to come up with fresh angles and material. You don’t want to become a carbon copy of yourself, you want to surprise readers, you want to move in new directions. Particularly with the subject matter I do, I really want to address things that are going on in the world today, and I want to do it in an exciting and interesting way. But sometimes that’s hard. So I’m doing that. I’ve not written off doing more of the fire stuff, but I’m right now under contract for the Jimmy Vega series. And I’m always interested in even eventually doing a standalone of some kind. I’ve never written that off, it’s just that when you’re under contract, you work under contract. It’s like being employed by anybody else, you just want to make sure that you get your work done first. But, yes, I love doing Jimmy because he’s a really interesting guy. He’s an everyday guy, he’s not a hero, larger-than-life. He’s just a really good guy who is trying his best, and he makes a lot of mistakes. And he tries to work through them. LB: So where can people find you online to keep up with you and Jimmy and Georgia? SC: Well, they can go to my website, SuzanneChazin.com. Even better, my Facebook page, which is Suzanne Chazin Author. So they can go there. The books are there. I’m really good at answering mail, readers do regularly write me and I always respond. And I’m always happy to also Skype with any book clubs. So if there’s a book club out there and they want me Skype with them, I’m always happy to do that. I Skype with a number of different libraries, San Antonio has been really good. I Skype with them on every single book. And I’ve had some other great experiences out in Illinois and upstate New York where I do that, so I’m very happy if anyone wants to get together book club, I will happily speak to them about any of the books. LB: Well, thank you Suzanne. I really appreciate you talking to me today. SC: Thank you, Laura. It’s been a pleasure. Thanks Laura, for the great interview. It was a pleasure to speak to you!